I would be a VERY ILL WOMAN TODAY if I had a doctor that was only willing to prescribe T4-only Levothyroxine drugs like Synthroid. My life literally changed when I found a doctor open to exploring ALL the thyroid treatment options to find what was right for ME. Funny title because there are far more than two big problems with typical conventional thyroid treatment for hypothyroidism (low thyroid). This article narrows down the main issues into two key categories while globally defining the problem. Patients want to know why it is so difficult for their doctors to listen to them about their thyroid. They want to know the real underlying answers. Patients simply want to know that there are solutions for them and how they feel, and you are probably one of them. But be prepared, the answers are just like each unique patient…far from typical. ONE, most patients are on the WRONG TYPE of Thyroid Hormone Medication. TWO, even if you are given the “right type” or not, most patients are not on ENOUGH OF IT. That’s it. It’s that simple most of the time. But WHY the typical doctor does not prescribe the right type of thyroid hormone medication or does not increase the dose to the point of relief is much more of an involved set of problems. Let’s tackle the first problem: The WRONG TYPE of Thyroid Hormone Medication. The massive majority of patients are prescribed Synthroid or its generic equivalent levothyroxine. This is T4 only therapy because the synthetic version of thyroid hormone is isolated and contains only one thyroid hormone, T4. This hormone is not the only type of thyroid hormone and it is also not the active form of thyroid hormone, known as T3. T4 normally converts into T3, which then activates the DNA of the cell to induce cellular changes. T4 does not do this at all, only T3. Most patients do not do well on T4 only therapy and will continue to have symptoms of hypothyroidism and low metabolism. Without T3, the active form of thyroid hormone, most patients will not experience full relief of their symptoms. Patients will also report that they get “side effects” from T4. Occasionally, some patients will have a true side effect reaction to T4 when it does not convert in the body to T3, causing a toxic effect to the body. This is relatively uncommon, but happens. The normal “side effect” of T4 only therapy is simply an “effect” of not having enough of the hormone medication to help relieve the symptoms of low thyroid and lowered metabolism. In other words, patients will report the effects of their continued suffering of low thyroid symptoms as a side effect of the medication because they do not know the difference. Their doctor often tells them that their blood work is fine, but they still have symptoms that they chalk up to side effects, when in reality their thyroid, physiology, and metabolism are still at square one. It’s like the train never left the station, but the conductor (your doctor) insists that based on analysis of the engine (blood work), the train must be moving. You believe the train must be moving because the conductor (your doctor) told you so, despite your own senses telling you it’s at a dead stop (your symptoms). Realize that you are the one IN the train. The conductor (your doctor) is doing his analysis of the engine from somewhere else, remote from you and the train (blood work). When you still believe the train is not moving (still having thyroid symptoms), there then must only be two conclusions. One, you’re crazy (your doctor offers Prozac). Or two, how you are still feeling is a side effect of the train moving (your low dose T4). But it’s not moving, and neither are you. And you are definitely not crazy! So what’s the RIGHT TYPE of Thyroid Hormone Medication? Almost invariably, patients will improve much easier and more effectively with prescription Natural Desiccated Thyroid (NDT) Hormone Medication. One great example of NDT is Nature Throid, made by RLC Labs right here in my backyard of Scottsdale, Arizona. I have prescribed this medication for my patients for years and it works great, with the right dose. NDT contains a full array of thyroid hormones that are present in a thyroid gland. T4, T3, T2, T1, T0, and Calcitonin. Calcitonin is a hormone that is often not discussed regarding thyroid health, but has the effect of helping with calcium metabolism and improving bone health. T3, or liothyronine, is the main active thyroid hormone that packs most of the metabolic activity and is largely responsible for the benefits of NDT. But the varying components, such as T2, play their role for your benefit. With all of these hormones present in appropriate and even small amounts, the various hormonal parts conduct a brilliant chorus and dance, working with one another to help you and your metabolism to function optimally. It’s a synergy of thyroid hormones. One plus one equals three…it’s more than the sum of its parts. Isolated T4 (ie Synthroid or levothyroxine) and even isolated synthetic T3 (ie Cytomel or liothyronine) are left on their own to operate without the full thyroid hormone complement. Synthetic compounded T4/T3 combinations can be very effective, but I have found over the years, that NDT works best. If your doctor is unwilling to prescribe NDT, consider visiting Hypothyroid Mom’s 30 online resources to find a good thyroid doctor and explore the lists of practitioners in your area who are willing to prescribe it. 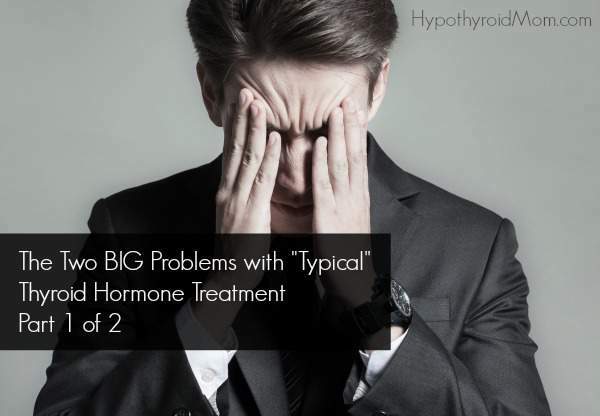 In my second guest post The Two BIG Problems with “Typical” Thyroid Hormone Treatment – Part 2 of 2, you will learn more about the second problem with thyroid hormone treatment, reasons why our current conventional medical approach does what it does and how you can start to improve your thyroid health despite it all. Can one or two drops per week of topical iodine(Lugol’s), along with high dose magnesium(1000-1500 mg), vitamins A, D, E, K2 and zinc, significantly improve thyroid function? Thank you.